Then along came Edward Bulwer-Lytton, who arranged in 1839 for the lead in his play about Cardinal Richelieu to say: “the pen is mightier than the sword”. Even more forgotten than Bulwer-Lytton, though, is what the stageboard Richelieu says next: “Behold the arch-enchanters wand – itself a nothing! – but taking sorcery from the master-hand to paralyse the Caesars”. Never mind that the real Richelieu thought more highly of his cats than of his clerks; this idea about pens has turned out to be a bigger seller, history-wise, in the camps of petty Caesars looking to lift their reputations, than in the camps of writers looking to paralyse anybody long enough to relieve him of his purse. 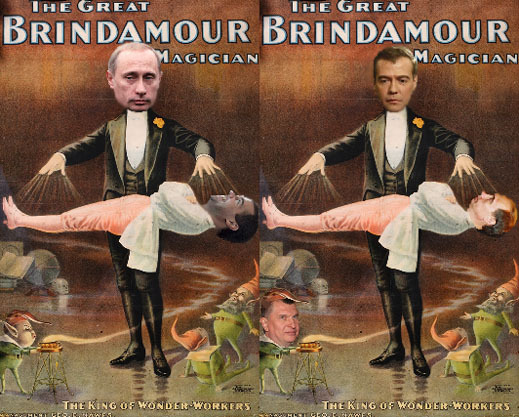 So what jolt of narcissism has led to the recent speculation on the part of scribblers in the Russian and global press that by replacing one speech-writing lady with another, President Dmitry Medvedev is testing his wand for a magical move against Russia’s other Caesar? According to the Financial Times of London (FT), Medvedev, now a year and a half into his 4-year term, “has taken a step towards putting his own stamp on the Kremlin with the appointment of two speechwriters.” Is that two stamps, Rumpelstiltskin-wise? Or is it two small steps for a man, one giant stamp for mankind? Hardly, because one of the new names has been there all along, first as Medvedev’s pen-holder when he was first deputy prime minister, and then as part of the speechwriting team ever since the presidential election. What sort of a team has Medvedev been leading, Kremlinology-wise, if he has been stamping on one of his speechwriters more than the other? When I used to work for heads of government, it was that quality of putting up with being stamped on that marked out speechwriters for their line of work. Presidents and prime ministers who didn’t need to stamp on their own staff to feel powerful usually produced better speeches for themselves. So is it the FT’s subtle intelligence that, by promoting one scribbler and hiring another to make two, Medvedev has been feeling doubly insecure for all these years – or is he about to be twice as assertive? Will we discover the outcome, in FT’s unerring fashion, when Medvedev delivers his annual address to parliament, reported to be “the most important speech of the year”? So can it be true that if President Medvedev has employed a new clerk to put words in his mouth – I mean, lift the words that have been rumbling there all along, deep in his viscera — Medvedev is less afraid of what Prime Minister Vladimir Putin’s mouth, or sword, might do to him, when he opens it? There have been tall stories of what happened to Medvedev’s mouth when he opened it to offend one of Putin’s deputies, and reportedly met a text correction on the back of a fast-moving hand. But that was before. Now that there is a new Kremlin speechwriter or two, how much more of the enchanting wand shall we see? Was there anything that ever came out of the mouth of the great founding president, Boris Yeltsin – first employer of the speechwriter now being replaced — that was more indicative of his verbal potency than his ad lib on encountering a Washington policeman in the dead of night: “I’m looking for a pizza”. With Yeltsin’s set-pieces for television, it was not what he said, but how many seconds there were between the tape-splices, that conveyed the real meaning of the corrupt disintegration he stood, and stumbled for. There wasn’t a single ordinary Russian who missed that then. They have also noticed that the institutions created by Yeltsin’s successors, including the annual speech to parliament, parliament itself, and the speechwriting team aren’t any better for the longer splicing. The only audience left with an interest in such magic are magicians, in training or on pension.